On February 1st, 2012, my plane touched down in Sudbury, where I was greeted warmly by David Shulist, S.J. We loaded my luggage into David’s car and away we went. My destination was the town of Espanola, or more exactly, the Anishinabe Spiritual Centre, which rests on Anderson Lake about five minutes south of Espanola. David pulled out a map, and as we drove, he showed me the towns and reserves that comprise the Manitoulin-North Shore region. Having come from Regina, Saskatchewan, I had not the vaguest notion of where we were headed. David sketched for me the history of the Jesuit presence in Upper Canada and Ontario, told me of the Jesuit martyrs who had lived alongside the aboriginal people four hundred years ago. He showed me on the map Wikwemikong, the only unceded reserve in all of Canada. He pointed out Spanish River and M’Ch’geeng, Sagamok and Little Current. The North Shore region is rich with Canadian and Jesuit history. It would be natural to feel part of the Great Spirit that overcomes doubt and strengthens, an evolving tradition that enfolds and enriches, that unites its people and enlightens them. Soon it was my turn to share. Why had I come? What was the purpose of my visit? I had no grand ambitions, no goal that could be so simply stated. I knew I would observe firsthand the lives of the Jesuits among the Anishnabe people. I would observe how the Anishnabe people and the Catholics lived alongside one another. What could be the fruit of Christian and Native spiritualities sharing a vision for a healthier, more loving, more peaceful world? What in their traditions do they hold in common, what in their traditions is complementary? What past and future do they share? In what ways do they differ? But there was a deeper reason why I had come. My motivation was not chiefly academic. I came to the Centre to volunteer and to help in whatever capacity I could. I wanted to serve the True, to play an active role in the mission of Christ. I would experience a taste of the religious life in an ideal setting, in circumstances that would grant me an opportunity to regain my spiritual composure and direction. I had long thought of becoming a Jesuit, but my spiritual life had become beset with worldly obstacles and doubts, mired in illusory thinking. I didn’t know where to go, what to do, for I had tried everything, and everything I had done had passed away into memory, into the contemplation of the hereafter. I had for some time lived in myself, for myself, and felt obliged to cultivate illusions about the self, the world, the other. I went along with a story, whether or not that story was true. At some point, I experienced a hunger of the soul to contribute to the well-being of a community of others who believe, to contribute to a greater and raised consciousness, to see and feel my own action in the Spirit, and to realize change in daily practice and action. I had decided that the opportunity to live communally, to share in the gift of life with others, would clear my mind and soul of illusions. In so doing, I would come to know a Spirit that would be True and eternal, not false and fleeting. 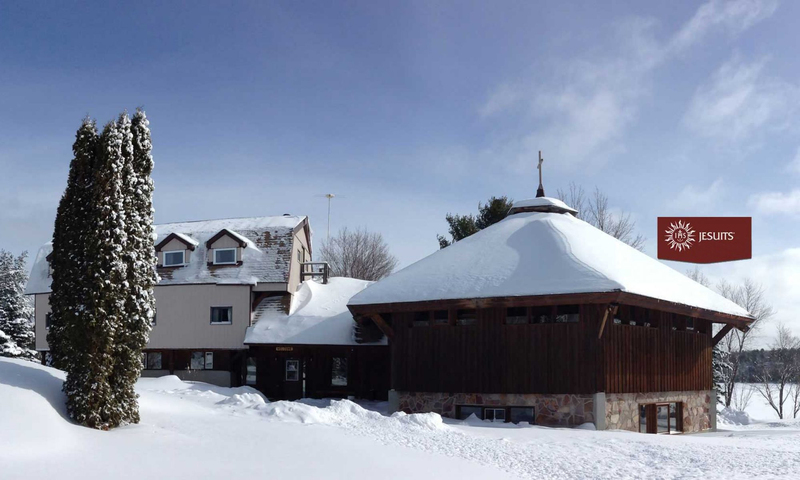 The Anishinabe Spiritual Centre provides a site and staff for individuals, communities, and organizations seeking retreat and rejuvenation. The Centre is Christian-Anishnabe, an evolving and creative vision drawn from the springs of the two traditions. It is also ecologically conscious. Care for the Earth and reverence for nature are two components of its identity. It is a five minute drive from Espanola, but remote enough to provide its retreatants with a setting that is picturesque. It is set on Anderson Lake, where there is fishing, canoeing and swimming. There are hiking trails and ample space on the grounds for walking, meditation, and yoga. (Very recently, ASC welcomed Arturo, a yoga master, as a member of the staff). The log cabins are spacious, warm, and equipped with all the amenities of home. Yet as log cabins, they feel intimately a part of their surroundings, inspiring a reverence for nature, for the gift of creation. For the volunteer, there is much to do, much to be a part of. The Centre functions as a creative hub for the surrounding reserves. 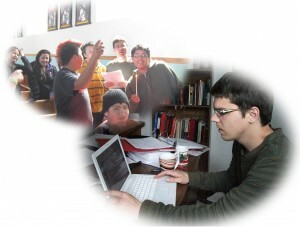 Paul Robson, S.J., and I regularly travel to Wikwemikong to teach students at the local schools about the sacraments. The Jesuits on staff assist members of the surrounding reserves in the organization of events, projects, and initiatives to build a stronger, more lasting faith in their communities. In my time here, we have hosted youth days, monthly ministries programs for lay ministers, and Masses for any who practice the faith. One of our ongoing projects is a year-round youth retreat that will inspire its participants to become stewards of Creation, better leaders in their communities, and to live the Gospel as their talents and gifts allow them to do. While the Centre is Christian-Anishnabe, it is an ecumenical space. People from all walks of life are welcome. Those who arrive to stay on retreat or to work as volunteers can expect to discover a vital balance in themselves, to feel more fully a part of the work of the Spirit, and to be affirmed in their faith, whatever that faith may be. I look forward to several more months as a volunteer, and hope that others may follow the same inclination I had, to become a volunteer at the Anishinabe Spiritual Centre.